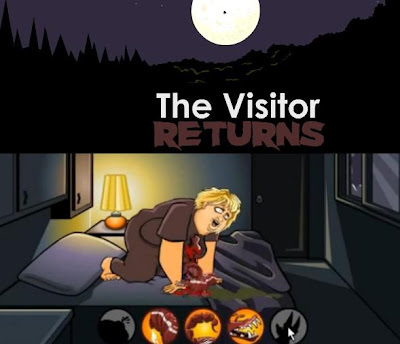 The Visitor Returns walkthrough will show you how to beat this game and get all 6 endings. If you are not familiar, this is a game written and animated by zeebarf and programmed by Steve Castro. It's a point and click horror adventure game filled with bloody scenes and has six possible endings depending on your actions. Many have waited for so long to see this sequel and it's been worth the wait. More horrific than ever and more bloody awesome. Not suitable for young players though. Meanwhile, here is The Visitor Returns walkthrough showing how to get all endings.